We walked down Piccadilly as streams of marchers cheered and the sound of whistles filled our ears. A black and red flag was waved out of Fortnum and Mason and pictures were held up at the windows by UK Uncut. Multicoloured paint splats marked international bank fronts which had cracks in the windows. The police stood guard outside these representations of global political and economic power. The people danced and sang as music streamed from the side streets and sound systems attached to the back of bicycles. A line of people linked arms as they walked down the street towards Hyde Park. Members of the black bloc gently gave way so that a small child could pass through them. As a group of teenagers I spoke to said, ‘It feels like a film. Like the impossible is happening. It gives us hope’. For a moment it felt like anything was possible. Such a moment is a challenge to ‘politics as normal’. It is a re-occupation of public space in which the breaking of windows signifies the entrance of new voices onto the political terrain. The occupation of space with music, reading and poetry is a shout against a privatised space in which people do not look at each other as they walk down the street and in which one’s ability to consume determines one’s value and voice. The shouts and whistles from the crowd outside Fortnum and Mason were moments of collective solidarity, disbelief and a hope that things could be organised differently. Outbursts of collective creativity and imagination like these, such moments of multiple thinking and acting that challenge ‘politics as normal’, threaten political elites of the right and left alike. They have been, unsurprisingly, responded to by a discourse which clearly demarcates civil and acceptable protest from uncivil and illegitimate protest. Experiences such as those of our walk down Piccadilly, as part of the TUC March on 26th March 2011, represented as thuggish violence . The objective of this discourse is to quell political and creative energies and experiments and to divide and debilitate nascent political movements and alternatives. 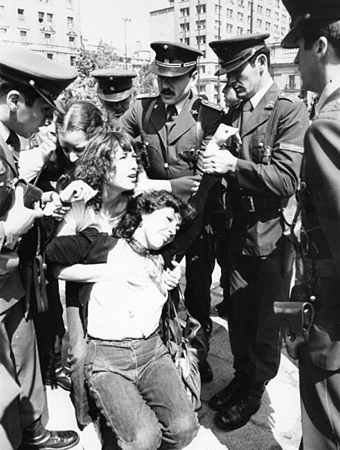 Chile was the pioneering experiment of neoliberalism in the 1970s. This experience was implemented through the auspices of a violent military coup which brought down the democratically elected government of Salvador Allende. The subsequent military dictatorship lasted 17 years and imposed a radically new accumulation strategy based around export-orientated free market reforms. It was premised on eradication of the collective ideologies, histories and cultures of the organised rural and urban popular classes and the re-assertion of the primacy of individualised and commodified social relations in public institutions and perhaps even more importantly in many areas of everyday life. The responses from the Left to this new reality were to re-assert the necessity for popular struggle. This was manifested in the mobilisation and radicalisation of grassroots militancy through marches, occupations of public space, the use of music and poetry to defend the dignity of the excluded and criminalised, the development of soup kitchens and cultural centres for political education and much more. The political opposition organised around two democratic opposition movements: Acción Democrática (AD), and El Movimiento Democrático Popular (MDP). The high-point of militancy came with the massive democratic protests of 1983-5. Yet by the late 1980s mass mobilisation had been quelled and de-legitimised. Chile returned to democracy in 1989 through an elite-led negotiated transition that guaranteed the continuation of the neoliberal economic model and a highly elitist democracy. How did this shift from popular movement to elite democratisation happen? The brief moment of challenge from below which manifested in mass protests during the mid-1980s was hugely significant. It created a coincidence of interests between the governing Right and the opposition centre-Left elites as both perceived their interests as threatened. They therefore sought a return to a consensual, elite-driven national politics, and both affirmed the need to impose discipline on grassroots militancy. This was manifested in a discourse of de-legitimisation and the criminalisation of popular protest, particularly that of the MDP. The MDP supported all forms of struggle to defeat the regime and had as its objectives the development of participatory democracy and a popular economy. Their protest and mobilisations were labelled by both elites of the regime and the moderate opposition as terrorist, uncivil and undemocratic. Such representations could be heard in the speeches of political leaders and read in the words of the mainstream media. These ‘psychological operations’ were used in an attempt to divide and fragment the opposition, isolate the more radical opposition from the people and justify the criminalisation of popular protest. This was combined with a strategy to simultaneously strengthen the ‘moderate’ elements that supported the state. The flip side of the discourse of the political elites and the media was that there was a civil and democratic opposition who constituted the majority of decent citizens. The moderate opposition was also strengthened with financial and political support such as funding from US and European institutions and think-tanks like the National Endowment for Democracy. Named as the legitimate opposition it was given access to negotiations with the governing regime. This discourse achieved its objectives. It ensured the criminalisation, marginalisation and fragmentation of popular protest and the maintenance of a highly skewed distribution of political, economic and social power, which is still present today. However, despite the formal political divisions between elite representatives of the two democratic oppositions the reality on the ground was different. Amongst militants and grassroots participants there was often political, cultural and social cross-over between the opposition blocks. The political reality was much messier than the discourse of democratic elites wanted to make Chileans (and the outside world) believe. Additionally, however, the strategy of the MDP contributed to its own defeat. They focused on defending and legitimising their strategy and objectives through a battle of ideas with the leaders of the AD. Their energies went on speaking with other political elites as opposed to speaking with society, particularly those most negatively affected by authoritarian neoliberalism. This effectively turned them into a vanguard elite, speaking in the name of popular democracy but having weak links with ordinary people. This made it easier for elites to de-legitimise, silence and criminalise their politics. What can this experience teach those of us working to challenge ‘politics as normal’ and create alternatives? Perhaps this experience suggests the need for political education involving a recuperation of the histories of popular struggle, popular culture and knowledges that neoliberalism, now in the form of the coalition government, attempts to eradicate. Perhaps this experience suggests the need to forge and strengthen the linkages, friendships and collective experiences of struggle amongst the base of our movements to disrupt the discourse of division repeated by political elites of the government and opposition. Perhaps it also suggests the need for a democratisation of politics and creativity; of the need to link struggles that move beyond ‘politics as normal’ to those communities, often absent on the 26th of March, most affected by the brutality of an increasingly authoritarian neoliberal marketisation. Thanks for this piece, I think you did very well in drawing lessons from previous/ongoing struggles and emphasising that, in reality, we’re fighting the same beast. Ok, but aren`t you setting up a bit of a binary here, if I disagree with and criticise a particular tactic am I instantly co-opted into the Regime`s strategy of de-legitimisation? The history of post-1959 latin america is littered with guerilla movements which for the most part were elite led by lawyers, students, university professors etc, a couple succeeded, most didnt but all faced (and continue to face in a few cases) exactly the same stratedgy of de-legitimisation that you`re suggesting for Chile. If I say Sendero were a blood-thirsty bunch of murderers am I buying into the discourse of Fujimori? The Senderistas and the Black Bloc are surely imposing their idea of what “radicaism” is on others, their actions have consequences for all of us, so I think we all have the right to criticise and disagree with them, and if they keep doing it – to condemn them, without it being considered that we`re any less radical or are being co-opted to a project of governmentality. Really? They only smashed a few windows on Oxford Street. Surely it’s the state’s response that imposes itself on us.